Good morning! Happy Friday! You made it to the end of another work week. Give God some praise ! 22Do not merely listen to the word, and so deceive yourselves. Do what it says. Have you heard the saying “You can talk the talk so walk the walk” (or any other variation)? Many believers can talk a good game when it comes to the word of God. They are courteous and kind when they speak of the goodness of the Lord. They can quote a number of scriptures. They can speak with a level of confidence and pray in such a manner that people are impressed by them. But many of those same people do not walk the walk. It amazes me when people say they love the Lord, but do not show love to their brothers or sisters. A stranger may never listen to a word that you say out of your mouth, but they could watch the steps that you make. Are your steps ordered by the Lord or by your own selfish ways? What does your walk say about you? The same is true in our spiritual walk; we cannot just listen to the word of God and not apply it to our lives. If you think that you can hear the word and trust that God will work everything out in your life without you doing a thing then you are mistaken. Faith without works is dead. You have to walk the walk. What is the purpose of hearing the word of God if you keep it bottled in all of your life? Who benefits from the lessons that you have learned? No one! If you don’t turn your faith into action then you haven’t learned anything at all. When you accept Christ as your personal savior, you should become a “working” Christian. You should work to be more like Him, work to encourage others, work to stop sinning, work to be a better person in Christ. You cannot do that if you are only a hearer of the word. 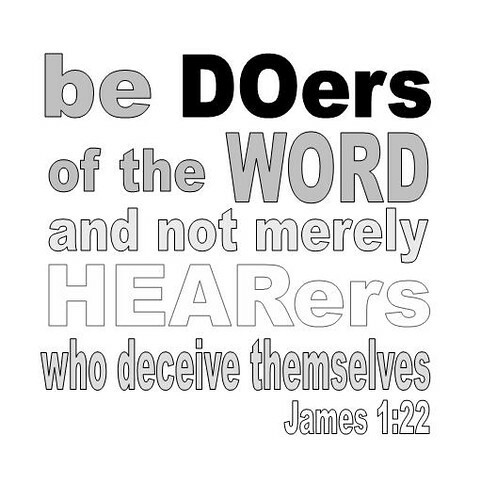 YOU HAVE TO BE A DOER of the word. Walk the walk. Your life may be the only bible that someone will ever read. What does your life say about Christ; does it say that He does not exist? Does it say that you doubt Him? Does it say that God is the answer? What does your walk say? Does your walk match your talk? Does your walk match what you heard? Are you walking this spiritual thing out? Have a blessed weekend. I pray that you are walking the Christian walk. Don’t be all talk make sure your walk matches your talk. God bless.